New York City 's surface water is supplied from a network of 19 reservoirs and three controlled lakes in a 1,972 square-mile watershed that extends 125 miles north and west of New York City. In the City's ongoing efforts to maintain the appropriate volume and high quality of water in the distribution system, there is some variation in the water sources used by NYC. 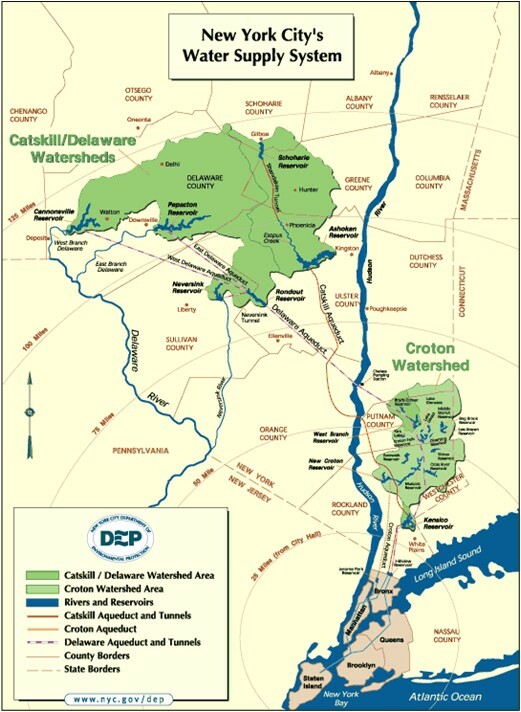 Approximately 90% of the water comes from the Catskill/Delaware (Cat/Del) System, located west of the Hudson River . The Croton System, the City's original upstate supply, normally provides about 10% of the daily demand from 12 reservoir basins east of the Hudson in Putnam, Westchester , and Dutchess counties. New York City also operates a Groundwater System in southeastern Queens that supplies an average of 1% of the City's total usage. While the quality of the surface water supplies is excellent, there has been some concern regarding compliance with anticipated future disinfection byproduct (DBP) regulations. DBP levels, particularly haloacetic acids (HAAs), have increased significantly over the past few years culminating in a maximum contaminant level (MCL) violation for HAAs in the Croton System in the second quarter of 2003. System operational changes and the Croton Filtration Plant (scheduled to be operational in 2011) will control DBP levels in the Croton System. However, HAA levels have also increased in the Cat/Del System to the point that compliance with EPA's proposed Stage 2 Disinfectant/Disinfection Byproduct Rule (D/DBP) rule is a significant concern. HAA levels are influenced by the concentration and characteristics of organic material in the raw water, the amount of disinfectant applied, the type of disinfectant used, the pH of the water, and the length of time the water and disinfectant are in contact.